Man's sterling silver ring inlaid with black onyx and dinosaur bone. Our Products >> Man's sterling silver ring inlaid with onyx and dinosaur bone. 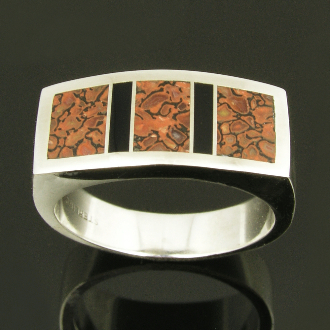 Man's sterling silver ring inlaid with dinosaur bone and black onyx handcrafted by Mark Hileman. Three pieces of reddish-brown dinosaur bone with black webbing are accented by two pieces of black onyx. The Utah dinosaur gem bone in this silver ring came from the Colorado Plateau and was a living animal during the Jurassic Period around 144 to 208 million years ago. Ring measures approximately 9mm wide and is shown in a size 10 for scale. This ring will be made to order in your ring size in 4 to 6 weeks.